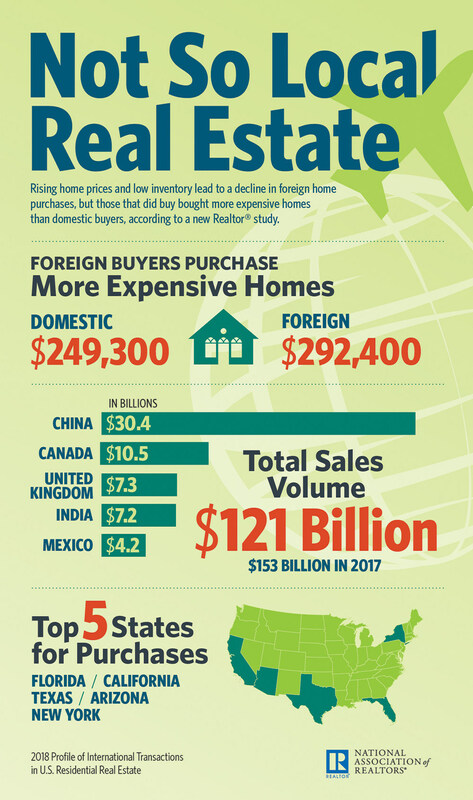 You are here: Home / Foreign Investment in Real Estate / International Real Estate Sales Slide in U.S.
Against insufficient inventory and mounting prices, international sales are sliding, according to the National Association of REALTORS® (NAR) 2018 Profile of International Transactions in U.S. Residential Real Estate, an annual survey. Foreign home purchases sank 21 percent from April 2017 to March of this year, and, a considerable share of those surveyed “don’t know” what the future holds for the international segment. Comprising 8 percent of existing-home sales, there was $121 billion in international sales in that time—a decline from a 10 percent piece of the pie the prior year. Forty-four percent of those surveyed “don’t know” what the international outlook is, while 25 percent expect foreign home purchases to remain the same, or shrink. According to Yun, the cause is the current haziness on immigration and trade. Again, buyers from China had the most dollars invested, and by a landslide, at $30.4 billion, followed by Canada at $10.5 billion, the UK at $7.3 billion, India at $7.2 billion, and Mexico at $4.2 billion, the Profile shows. Buyers from China also made the most expensive purchases, at a median $439,100, and the highest investment in terms of units. According to the survey, the motivation to purchase varied, but the majority were primary residences (52 percent), and likely detached, single-family properties. All-cash comprised 47 percent of sales. Approximately 10,300 REALTORS® responded to the survey. The post International Real Estate Sales Slide in U.S. appeared first on RISMedia.